After arriving in Cairo one-by-one, the team members of the Koch-Ludwig Giza Plateau Mapping Project have finally begun work preparing the excavation site and their storeroom for the upcoming season. 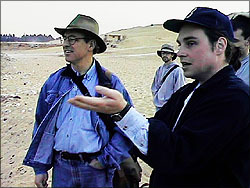 Having received the required clearances from the Supreme Council of Antiquities (the branch of the Egyptian Government which oversees all archaeological projects and sites) and having also met with Dr. Zahi Hawass, the Chief Inspector for Giza and Saqqara, Dr. Mark Lehner and John Nolan visited the location of previous seasons' excavations. This field work had uncovered bakeries used in the Old Kingdom to produce massive amounts of bread for the workmen constructing the pyramids and tombs at Giza. Also, recently discovered near these bakeries, apparently contained by a meter and a half thick mudbrick wall was a fish processing plant, featuring long, low benches, plastered with white limestone dust, and floors covered with the bones and scales of fish. The goal of the upcoming field season is to follow the mudbrick retaining wall to the west in hopes of determining the nature of the large building. The first order of business was to hire workmen. After receiving permission to begin work, word was sent to Abdul Wahab, the foreman (or, in Egyptian Arabic, "rais," which is pronounced "RAH-ees") who had worked with the team in previous seasons. 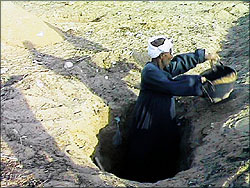 It is his responsibility to gather men who are willing to work, negotiate their wages and act as an intermediary between the team members and the workmen during the excavation. Two days later, Rais Abdul Wahab had appeared at the storeroom with a crew of between 20 and 30 men. Before we can begin excavation, we had to organize and clean the storeroom assigned to the project by the Supreme Council of Antiquities. This storeroom will not only house the finds from previous seasons, but will also be the place where all material to be excavated in the coming weeks will be processed. The work of sorting through this material, comprising broken pieces of pottery, stone tools, inscribed sealing mud, bones and seeds, is an important part of archaeology. In a sense, the stories these pieces of evidence tell us will help to reveal how our ancient building was used. After the area in front of the storeroom was cleared of debris, a grid of bricks was laid out on several mats on the top of a nearby tomb. 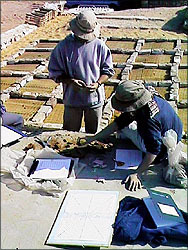 This checkerboard grid is used by the team members to sort the pottery from the site according to size, shape and function. Soon after this grid was set out, team members Jason Ur, Justine Way, and Thomas Kittredge began by sorting ceramic "sherds" (the term for pieces of broken pottery) from previous seasons to practice for the new material from the excavation. 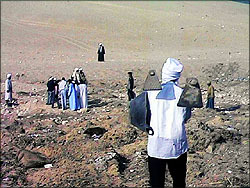 While the storeroom was being put in order, Rais Abdul Wahab and his crew of men had moved the kilometer or so down the plateau to the excavation area. In the more than two years since the previous field season, much sand and debris had accumulated on top of the bakeries and the fish processing plant. Also, after each season, the Giza Plateau Mapping Project had covered over the site with sand to hide and protect it. Both these factors make locating the site initially difficult. Although during excavation the "squares" used by the archaeologists are defined by carefully positioned iron stakes, locating these pins later, under mounds of modern sand, is often a guessing game. Under the direction of Dr. Lehner, several test pits were sunk in the sand to try to find these old metal pins. After two days of searching, one, whose old, tattered label was still intact, was found. Using the coordinates of this stake, the rest of the excavation area was defined. Now, realizing where our food processing building lays, we are clearing away the modern debris, and should be able to begin digging in a few days.